Children, from the moment they are born, require loads of attention, preparation, and often special equipment to keep them healthy and safe. This is especially true when they are small, in the baby and toddler stages. Unfortunately, defective and dangerous products make their debut onto the market on a routine basis and often pose serious injury risks to children. 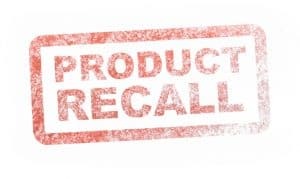 As a parent, it’s important to remain aware and up-to-date on current product recalls posted by the Consumer Products Safety Commission (CPSC) to ensure none of these products are currently present or in use in your home. The following are some examples of recently recalled and potentially dangerous products that threaten the safety of babies and young children. The problem with these bed kits involve the hardware kits that are meant to secure the wooden wall enclosures to the wall studs. They do not provide proper bracing support and pose a significant tip-over and entrapment hazard that can result in injury or even death to children. This recall affects about 2,300 units. All consumers should stop using Murphy beds manufactured with these recalled hardware kits. Consumer should then contact Rockler to obtain a free replacement repair kit that includes instructions. The company is contacting all known purchasers of this product. The television is connected to its swivel by mounting screws that are susceptible to becoming loose and causing the television to fall off the stand and tip over without warning. This poses a serious tip-over and entrapment hazard for children that can result in their injury or death. This recall affects about 755 units in the United States. Customers in Canada purchased 130 of these units. Consumers who use the swivel stand should detach it immediately and put the television in a safe place away from children. Contact Panasonic to receive a free repair kit. These bassinets fail to conform to the mandatory federal safety standard for bassinets and cradles. As such, they pose a fall and entrapment hazard to babies. This recall affects 1000 units. Consumer should stop using the Multipro Baby Cradle N Swing immediately, disassemble the unit, and discard it permanently. If you purchase the product on Amazon.com, the company should have contacted you directly and issued a refund in the form of a gift card for the full purchase price of this bassinet and cradle unit. The headboard of the bed is susceptible to disconnecting from the bed frame and falling onto the bed, posing a dangerous entrapment hazard to children. This recall affects about 75 units. Consumers should remove this toddler bed from children immediately and contact The Land of Nod for instructions to obtain a complete refund. The company is contacting all known purchasers of the product. The above recalls are only a few examples of the defective and dangerous products that can negatively affect children today. If your child was injured due to a defective product, the Los Angeles injury attorneys at Taylor & Ring can help you hold the negligent party or parties accountable, including the manufacturer and other possible entities as well. To schedule a no-cost, initial consultation, call us today at 310.776.6390 or reach us through our contact form.